The HangerJack is the perfect space saver for a closet or garage. It can handle up to 50 pounds – and it folds flush against the wall when not in use. We installed it in a garage where we tested it with several items, such as extension cords, shovels, and other assorted tools. It’s extremely sturdy. The company also says it can be use for bike storage, hose storage, and even a ladder. 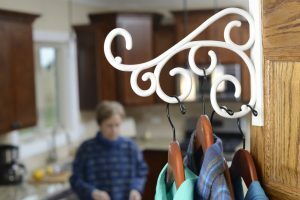 For indoors, it can serve as an extra clothes hanger. It comes fully assembled with instructions. The instructions could provide a little more detail on how to get the device to spring out and fold. The release button on the model we tested was not functioning, but we were able to solve the problem with a screwdriver and gently pried it open. Some of the Amazon reviews said the release button was hard to find. We had no problem finding it, but it just didn’t work. Also be careful, because it is spring-activated so watch your fingers when activating the spring. It’s 24-inches and really helps clean up the clutter. It has a strong PolyCarbonate shell and made in America, which is rare these days. It sells for $29.95 at Amazon. The company also sells the HangerJack Scroll, which is perfect to hang on the back of a door to provide more closet space. You can buy 2 and get the third one free for $21. We tested it out with ties, bathrobes and formal dresses. It is extremely sturdy and did not leave a mark on the door.